Open 8pm-11pm FRIDAYS AND SATURDAYS IN THE MONTH OF OCTOBER. ALL General admission tickets and Combo pack tickets include: "THE HAYRIDE" ,"THE HAUNTED CANNERY" AND "LUNATIC ASYLUM" – Combo Pack tickets also include the kid friendly non-haunted FLASHLIGHT CORN MAZE. Located at Walters Pumpkin Patch. (The Pumpkin Patch daily activities closes at 7:00pm when patrons exit the farm to the parking lot) Gates open at 8:00 pm til 11:00 pm Friday and Saturday nights in October. Victims get aboard either the tractor pulled Haywagon or the "Hell Bound" Ambulance (RIP TICKET required) for the start of your nightmare adventure traveling down a long, winding, dark, deserted road crossing over the low water bridge and cautiously heading through the corn and pumpkin fields. Once inside the Lunatic Asylum maze, patients bang their heads and plead to leave the "hell" that they are in. If you stay in the asylum too long, you actually feel like you're going to go insane. Then enter the Haunted Cannery. It is the ultimate 4 story fun house filled with horrifying music, clowns, chainsaws, zombies, spiders, slipper slides, snakes, werewolves, vampires and anything horrific that comes to mind. In fact, the Haunted Cannery is everything found in your WORST NIGHTMARE. Participants who pay extra for RIP (speed pass) ticket admission get to experience the closed lid casket ride at the RIP MORTUARY. That crazy "Hell bound" ambulance driver drops you off here first. Now take a horrifying close encounter to dying and experience the underworld while locked in a claustrophobic casket. (limit 2 corpses). But then you should start worrying. If after unlocking that casket lid after your ride, your RIP (speed pass) ticket allows you to be "first in line " of all the other crazies waiting in line getting into the Lunatic Asylum. 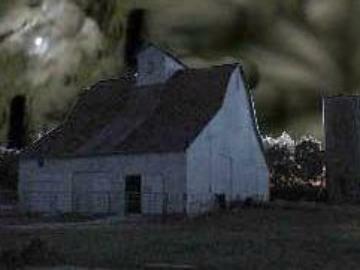 GENERAL ADMISSION: $20 Friday / Saturday Haywagon ride to "The Haunted Cannery" and "Lunatic Asylum." COMBO PACK: $30 Friday / Saturday Haywagon ride to "The Haunted Cannery" and "Lunatic Asylum" PLUS Flashlight CornMaze (a kid friendly non-haunt) at Walter's Pumpkin Patch. R.I.P. ADMISSION: $40 Friday / Saturday -Thrilling ride in The "Hell Bound" Ambulance to the "LUNATIC ASYLUM" and "The Haunted Cannery SPOOK HOUSE" , PLUS experience horrific claustrophobia in a closed lid Casket ride ( fits 1 or 2 corpses) at the exclusive RIP Mortuary, PLUS Flashlight CornMaze (a kid friendly non-haunt) at Walter's Pumpkin Patch. SAVE 10% per ticket Friday or Saturday nights with Groups of 10 people or more for General Admission, Combo Pack tickets, or RIP tickets. This offer is only available for online ticketleap sales and is not offered at the door. Single or multiple tickets may be purchased at the front door entrance during business hours (8-11pm Fri/Sat) or buy tickets online anytime. A service fee applies to all online purchases. Not recommended for children under age 12. No strollers or babies in carriers are allowed on the hayride wagons at night. They may wait at the well lighted kid friendly concession stand area with an adult. No Alcohol or drugs permitted on the property or in buildings. No Smoking in buildings. Please no flashight or lighter usage in haunted dark areas. We want to scare you?? The Haunted Cannery & Lunatic Asylum uses strobe lights and/or fog machines. These effects can trigger symptoms for those with asthma or seizure disorders. Please bring an inhaler if you use one for asthma. Do not enter if you are prone to seizures. Those who are pregnant and /or have heart conditions, asthma, arthritis or are on crutches/braces are not encouraged to attend the event. There are very narrow passages going up and down and slipper slides that are very fast. Please wear appropriate clothing for an indoor / outdoor event. You will be on a working farm. Wear coats and long pants & preferably no open toed shoes, no flipflops, no shorts exposing bare skin on your legs, as there will be exposure to dirt, mud, dense fog and/or smoke, uneven floors or ramps, dark & FAST slipper SLIDES, dimly lit stairs, snakes, darkness, loud Noises, electrical shock, bright lights (including Strobe lights), and other scary surprises. Lost and Found items will be turned in to the front office at the farm. We are not responsible nor liable for lost /found items, torn or soiled clothing items. There will be a service fee applied to online purchases at Ticketleap. Groups of 10 or more purchases are available online only. Not available at the door. Concession stand is open til 11:00 pm with plenty of lighted picnic table seating available to use.